Constructed for King Carol l in the late 1800's, Peles Castle is a Neo-Renaissance castle high in the Carpathian Mountains of Romania. The country gained its independence during the king's rule and he decided he needed to build a royal hunting perserve and summer estate in the beautiful mountains for himself and his family. Alin Constantin does a wonderful job capturing this majestic, Romanian castle from above. 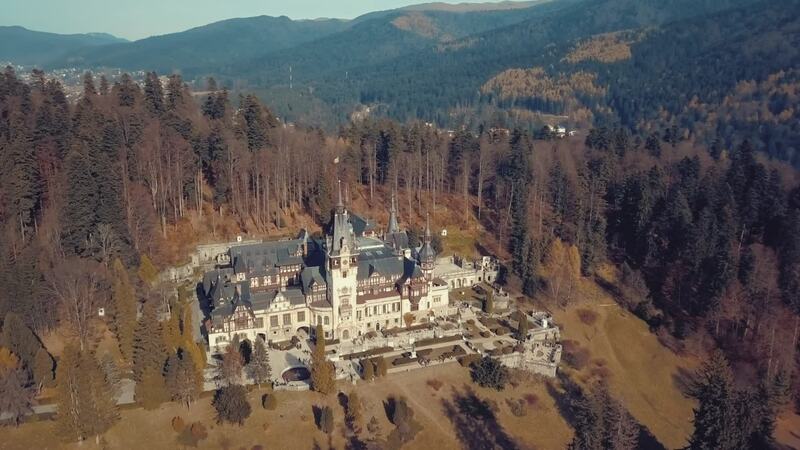 Description: Peleș Castle (Romanian: Castelul Peleș pronounced [kasˈtelul ˈpeleʃ]) is a Neo-Renaissance castle in the Carpathian Mountains, near Sinaia, in Prahova County, Romania, on an existing medieval route linking Transylvania and Wallachia, built between 1873 and 1914. Its inauguration was held in 1883. It was constructed for King Carol I.